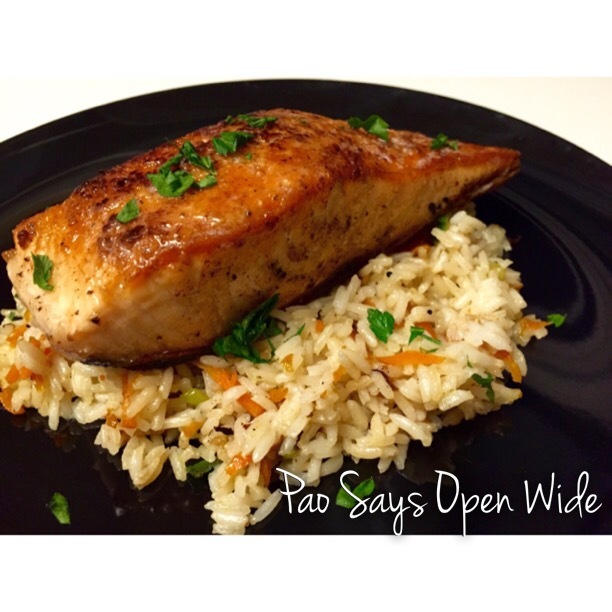 I’m in Love with the CoCo: Coconut Lime Salmon with Coconut Rice – Pao Says, "Open Wide!" A small dose of warm weather is enough to make me want to go full-blown tropical. Since I’m in New York, not exactly an exotic, sunny, beachy paradise, I figure I should channel the tropics through my food for a more authentic experience. What’s more tropical than a coconut?? So, for dinner, I incorporated coconut oil into my dish. I cooked my salmon in coconut oil, and I added a bit of the oil to my rice, as well! The result was a subtle, fresh, buttery coconut flavor complementing the salty, oceany flavor of the salmon, and a touch of sweetness added to my savory rice. This dish is very easy and quick to make- a perfect weekday meal! Pat your salmon dry. Liberally season the (non-skin) side with salt and pepper. Squeeze a bit of lime over the top of the filets. Sprinkle the cornstarch over the filets to lightly coat the top. This cornstarch coating helps the salmon crisp up nicely while cooking. Heat up your pan with a tsp of coconut oil to med-hi heat. Once the pan is hot, place your salmon seasoned-side-down. This should cook for about 2-3 minutes. While the flesh side of the salmon is cooking up, salt and pepper the skin. Add the other tsp of coconut oil to the pan and flip your salmon. Cook it for another 2-3 minutes. (** cooking times vary according to salmon thickness. This is for an inch thick piece. Just keep an eye on your fish and flip once the cooked line comes up to about a third of the side). Once your fish is cooked, squeeze a bit of lime over the top, and you’re ready to serve! Once the rice is cooked, place about a tsp of coconut oil in a pan (I used the pan I just cooked my salmon in, which already had some residual coconut oil), and cook the carrots, lime zest, and scallions for a minute or two over med-high heat. Add in the rice and stir until combined. Finish with a sprinkle of cilantro, and the rice is ready to be served!